There are lots of reasons why a curator or collector might inquire about his work. 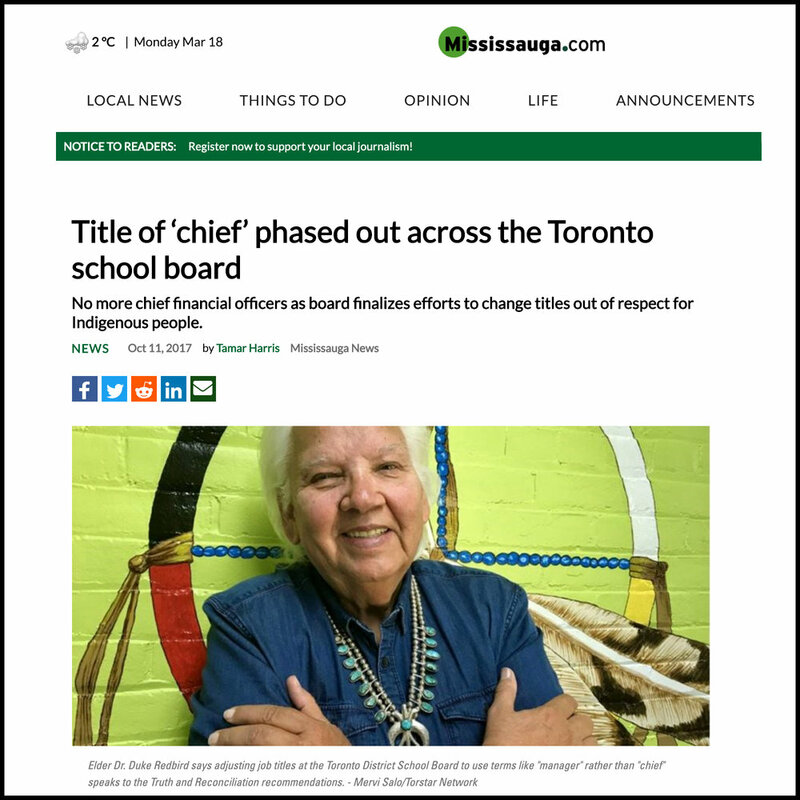 The Toronto District School Board (TDSB) will stop using the word "chief" in job titles, citing respect for Indigenous communities. The TDSB said the decision was inspired by the Truth and Reconciliation Commission's (TRC) final report, though the change is also part of a larger initiative to rename titles within the board. While the TRC report did not explicitly call for the removal of titles such as chief from non-Indigenous applications, it did call for improvements to education, language and culture. In what must be a speed record, the Awen Gathering Circle stands tall, the site is landscaped and the opening ceremonies are complete. The project was included in the town’s waterfront master plan last year. The dream came to life faster than expected when the town received an offer from the United Steelworkers of District 6. 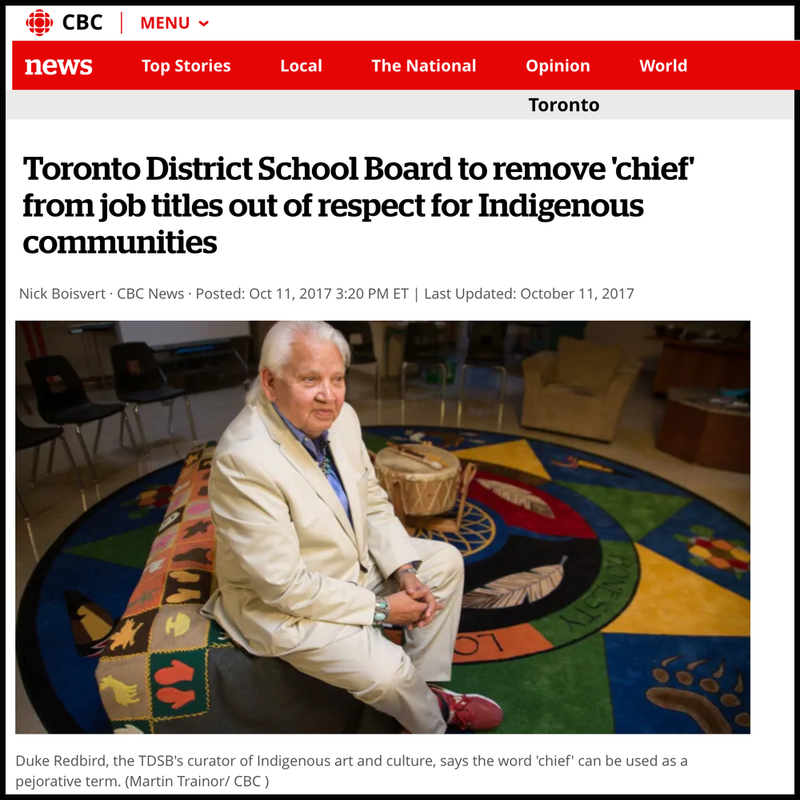 The Toronto District School Board is completing a phase out of the word ‘chief’ from job titles, out of respect for Indigenous people. Titles such as chief financial officer, chief academic officer and chief communications officer will see the word ‘chief’ removed and replaced with ‘manager’ or something similar. The changes include 12 chief positions in the professional support services department where the word manager is now used. The work began a few years ago and is now concluding, TDSB spokesman Ryan Bird said. Since the 60s, the Anishinaabe Elder and wisdom keeper has done a little bit of everything, from poetry to painting, acting to journalism, education to farming. He’s played with Joni Mitchell and Bruce Cockburn, curated at Expo 67 and had his words recited to the Queen. If not always acknowledged, he’s been an important figure in Canadian arts and culture for the better part of a century…. Largely unheard, criminally undocumented, but at their core, utterly revolutionary, the recordings of the diverse North American Aboriginal community will finally take their rightful place in our collective history in the form of Native North America Vol. 1: Aboriginal Folk, Rock, and Country 19661985. An anthology of music that was once near-extinct and off-the-grid is now available for all to hear, in what is, without a doubt, Light In The Attics most ambitious and historically significant project in the labels 12-year journey. Native North America Vol. 1 features music from the Indigenous peoples of Canada and the northern United States, recorded in the turbulent decades between 1966 to 1985. It represents the fusion of shifting global popular culture and a reawakening of Aboriginal spirituality and expression…. Earlier this year, Rosanna was invited to the Megaphono Festival in Ottawa, to host a panel called Indigenous Trailblazers: Carving Paths Through Tradition at the National Arts Centre. On the panel, legends like Willy Mitchell, Alanis Obomsawin, Dr. Duke Redbird and Leland Bell, sat alongside up and coming musicians like Jeremy Dutcher, Leanne Simpson, Cody Coyote and Melody McKiver. They were there to talk about music, the arts, politics and issues facing Indigenous communities today. Many of the artists later performed onstage at the National Arts Centre, as part of the Native North America Gathering concert, which was a collaboration with music historian Kevin Howes, who in 2014 released the compilation, Native North America Vol. 1. TORONTO — Toronto District School Board students may be preparing to leave school for the summer, but those who have a tough time saying goodbye will be able to go back to school — and those of yesteryear — during the break. A day after an Ontario judge dismissed a bid to ban the use of the Cleveland Indians' name and logo in Toronto, one Indigenous arts expert wants the team to consider another name altogether: the Cleveland Turkeys. Duke Redbird, a consultant on Indigenous art and culture for the Toronto District School Board says his irreverent, tongue-in-cheek suggestion provokes exactly the kind of offence in fans loyal to the Cleveland team that Indigenous people feel when they find themselves turned into mascots. Pierre Trudeau expressed his hard-line position against Aboriginal self-government many times as prime minister. After fighting Quebec francophone nationalism all of his political life, there was no way he was going to roll over to demands for Aboriginal nationalism. He despised ethnic nationalism on principle and besides, he knew that negotiating self-government with Aboriginals would only embolden Quebec separatists to make similar demands. His stark warning of a bloody confrontation came at a 1983 meeting in Ottawa between Trudeau and members of his cabinet and Aboriginal political leaders. There was to be a televised meeting the next morning, and the prime minister wanted to be briefed on the direction the discussions would take. 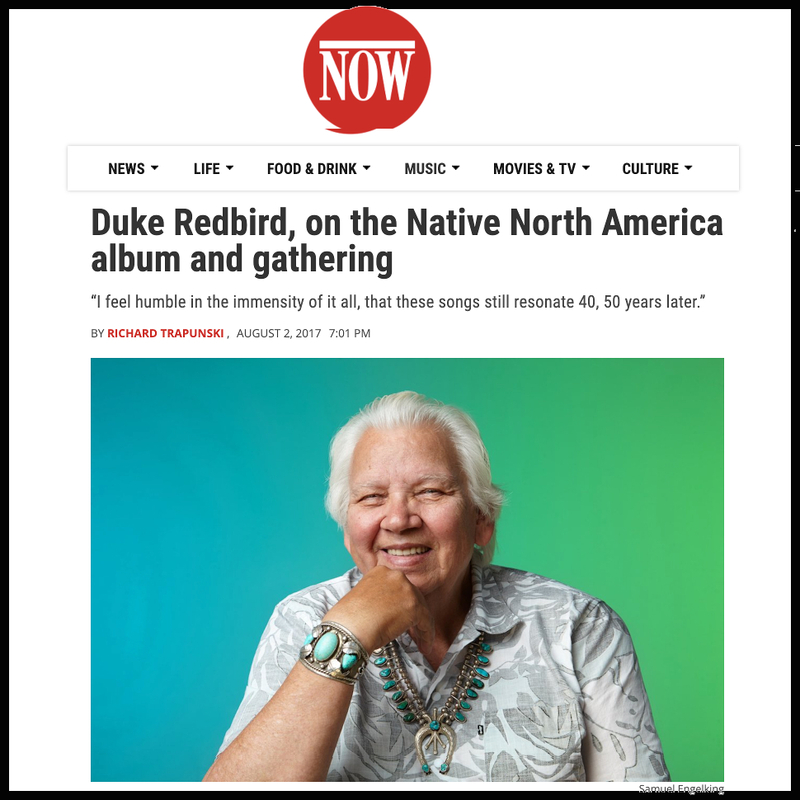 This is the second segment of the interview with Duke Redbird. I learn so much from these interviews, and I hope you do too, and I never know what I will take away. When Duke was asked about his one wish, he responded that he’d like to see what the world looks like in 100 years. And he would take the 25-volume set of Encyclopedia Britannica on a deserted island because that’s all he would need. Duke told a story about a core message from his mentors and I was touched by it, we are our brother’s keeper. We live in a me-me-me world, but that’s no excuse. What are your thoughts?